Over the next few months, many people will hop on an airplane to visit friends or family for the holidays. At some point in my life, I read about why airline miles are much more popular than hotel points (even though hotel points are more valuable). The reason is that our minds plan out trips sequentially. When planning a vacation, we first want to take care of airfare, then we will look into making a hotel booking. Thus, an average person might find it hard to envision the total cost (including all the extras) of his vacation or family trip. Most people who come back from a vacation that involves air travel often complain about how expensive everything was along the way. 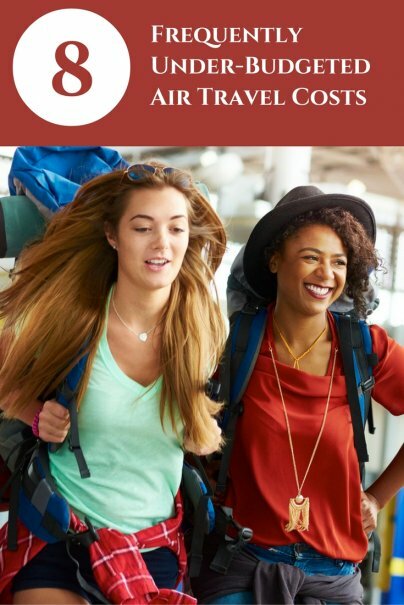 Check out the list below for air travel charges you should budget for. When booking tickets, I suggest you go ahead and make a total airline cost spreadsheet, because the cost of baggage when comparing airlines can make a significant difference. I’ve heard people talk about how the price is the same to fly with multiple airlines, but that is not true when you factor in extra fees and charges. Since there are five people in my family, any time we can get on a Southwest flight we save a bunch in baggage fees. While traveling, you might consider one of these five ways to minimize baggage cost. If you are flying stateside, don’t expect to get a free lunch. For the most part, those days are over. Remember, also, that airports tend to have inflated meal prices because they have a monopoly. You’re not going to drive to the nearest restaurant while you’re waiting for a connecting flight. Of course, the obvious alternative is to take your own meal. For those who will travel overseas, you should expect to pay a fee to exchange your currency. However, different ways to exchange your money carry varying fees. Depending on how long you plan to be on vacation and how much you plan to spend, that could make a significant difference. As an example, if you use a Visa or MasterCard that charges a 3% foreign currency exchange fee compared to a 0% foreign currency exchange fee credit card, then on a $5,000 vacation you can save $150. A personal pet peeve about traveling in America is all the people along the way who expect you to tip them. If you are traveling in and out of airports and in and out of hotels, you will likely incur some tipping expenses. Showing up at the airport with nothing to do can be expensive. The airport is one of the most expensive places to buy a book. In addition, some airlines are starting to charge for use of internet or movies. Consider your entertainment needs before getting on the flight, and bring your own. The cost of getting to and from the airport can really add up. Determine which of these options is the cheapest for you: taxi, shuttle bus, stay at a hotel and leave your car, airport parking lot (don’t forget to look for an online coupon), or have a friend drop you off. If traveling internationally, you should expect to pay fees for tourist visas. You’ll need to find out details about that particular country. If you don't have the money to pay for the trip and think you can just charge it, let me just say that is a horrible game plan. The expense of the trip will be outrageous. If you are in credit card debt or getting out of credit card debt, you should consider a staycation or a vacation that doesn’t cost any money. If you are paying interest on a credit card, this is not the right time for a vacation. While planning a vacation can be a lot of fun, you need to be sure to add all these extra fees into your budget or you’re going to run out of coins before you even get to your destination. Can you think of any more often overlooked travel costs? "A personal pet peeve about traveling in America is all the people along the way who expect you to tip them." Really, Craig? Those who work for tips (waiters, baggage porters, cleaning people, etc.) are not doing so to tick you off - they're just trying to earn a living wage! Many people whose earnings depend on tips are paid well below minimum wage, and many tipped workers who work full time or more still can't manage to earn above the poverty line. As a seasoned traveler, you know when tips are expected. Maybe it's time to just accept the tipping system we have in America, recognize that by under-tipping you do nothing to change the system and only hurt those least-paid workers, and plan to tip! Reframe a negative to a neutral? Thanks for the comment. I know that those who ask for tips are doing that to earn a wage. I’m not bothered by those who work for tips, but the system. I do tip. What I’m saying is I love traveling in places like Japan when people do a great job helping you and don’t expect to be tipped. The reason they do so is not because they are better people, but because they are paid better by the organizations that employ them. Personally, I like places that have non-tipping system. I don’t recall suggesting that people under-tip because that is not what this post recommends. Again, the main point here is when you travel in America remember you will need to tip people so budget for that. Another possible expense could be vaccinations and travel medications. This is, of course, very dependent upon where you travel. But, especially if you're going to less developed areas it might be recommended that you are vaccinations/take meds for things like typhod, yellow fever or malaria. These may or may not be covered by insurance (mine have never been...they'll pay to cure me of malaria but not to prevent it). And, in some cases, they can be fairly expensive (malaria meds for an area of India which was resistant to cholarquine was $150 for a two week trip). But, looking at this another way, there are also savings that you might or might not want to calculate into your vacation budget. While you're gone, you're not driving your car. So, provided you're not renting a car, you're saving on gas. Your utilities will be lower if no one is staying at your home. You might be able to get a credit to your account for newspaper subscriptions that you put on vacation hold. Snacks & drinks - no matter how you're traveling. Airport food is notoriously overpriced as are vending machines at hotels. Quick stops & fast food along major highways can cost $5 and up per snack, which can add up over a few days. We try to take as much as we can/are allowed, or find major grocery stores or big box discount stores to stock up en route. Also, parking fees, especially when visiting urban areas, & toll fees in certain parts of the country.